Information: Sarah Gertrude Knott (1895–1984), organizer. Gertrude was founder of the National Folk Festival Association in 1934. She was born in Princeton, Kentucky in 1895, and raised in a family of farmer-school teachers. Gertrude attended the single-room Knott School situated between the farms of her two grandfathers. However, it was at the newly established McCracken County High School where Gertrude found her love for stage production, a passion that she would pursue throughout the rest of her life. Following her father’s death in 1918, Gertrude moved to Pittsburgh to attend the King’s School for Drama, transferring to the Elias Day Bush Conservatory in Chicago before returning to Kentucky to attend Georgetown College. She moved to St. Louis in 1929, where she worked for the local theater guild, the Dramatic League, until she organized the first National Folk Festival in 1934, presenting primarily her beloved Appalachian folk culture. 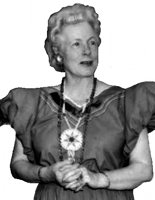 After WWII, she asked Vyts Beliajus to include other ethnic groups, resulting in an annual festival at which many international folk dance leaders acquired dances. Gertrude continued to work as the executive director of the festival until 1970. Gertrude passed in 1985, just shy of her ninetieth birthday, due to complications arising from a stroke. Even after her retirement and death, the festival has retained its founder’s wanderlust, relocating to a new city every several years. National Folk Festival Association, an article. Three Kinds of Teachers: Which Shall We Follow?, an article.